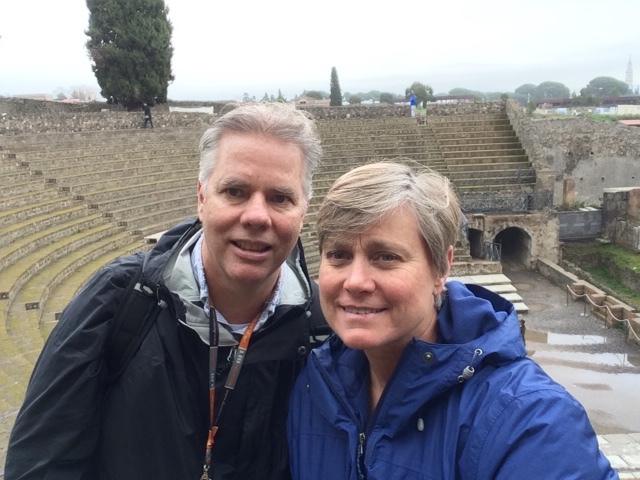 Today we checked another item off our bucket list by visiting the ruins of Pompeii. There is no way to fully express the depth and scale of this incredible place so I'll just simply say that if it's not on your bucket list, put it there and if it is, get there! The weather was at an all time low, unfortunately, but our trusty raingear helped us fulfill the good Swedish truism, there is no bad weather, only bad clothing. Mostly it was just blustery and not raining, so there are small things to be thankful for. We had heard that a guided tour is really worth it but unfortunately, there were not enough takers for an English tour so we ended up with the audio guide which actually worked out just fine. 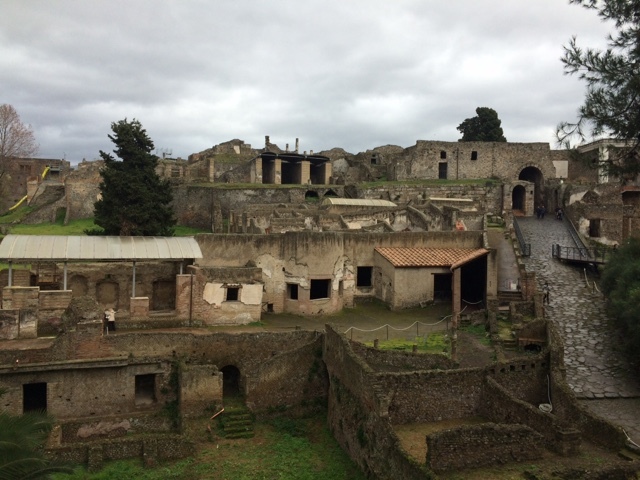 What is clear is that you could take an entire semester long class on Pompeii and likely not learn everything there would be to learn about this remarkable city. For starters, it is HUGE. 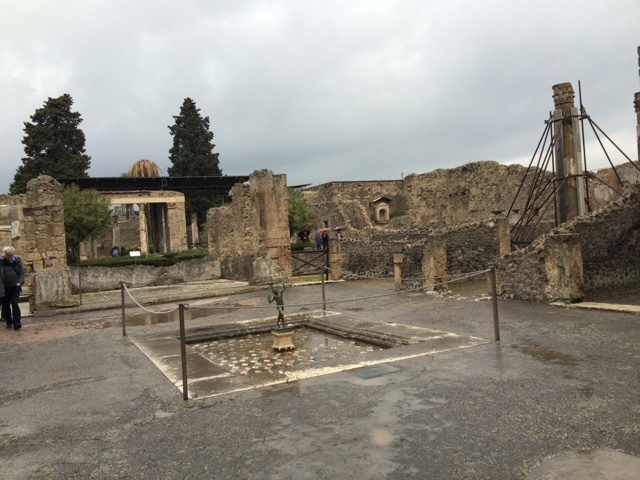 The sheer scale of Pompeii makes it impossible to see every nook and cranny that has been excavated so you do the best you can and try to make sure you see the major stuff. Taking photos feels ridiculous so I didn't actually take that many. Perhaps the few posted here will give you a small idea of what we experienced. 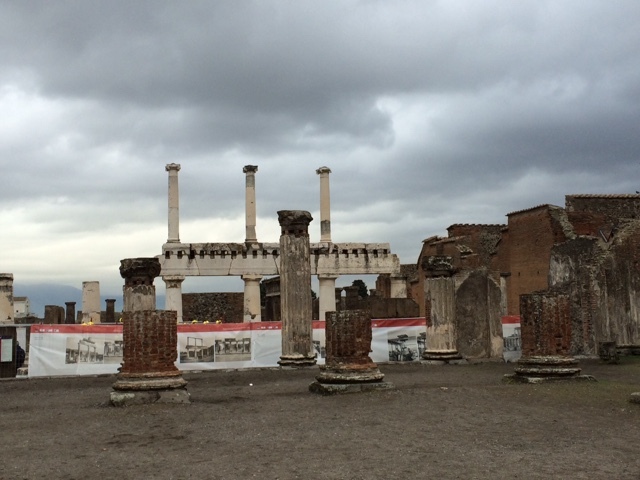 It is quite amazing to think about how very old this place is. 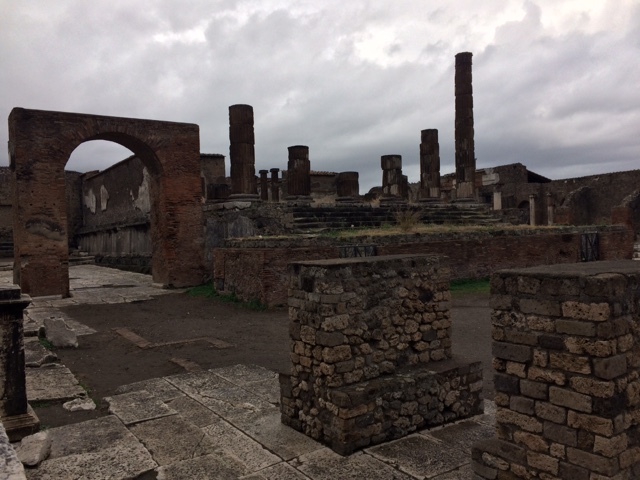 Remarkably, there was huge earthquake in A.D. 62 which required a great deal of rebulidling, much of which wasn't finished when the eruption occured in A.D. 79. 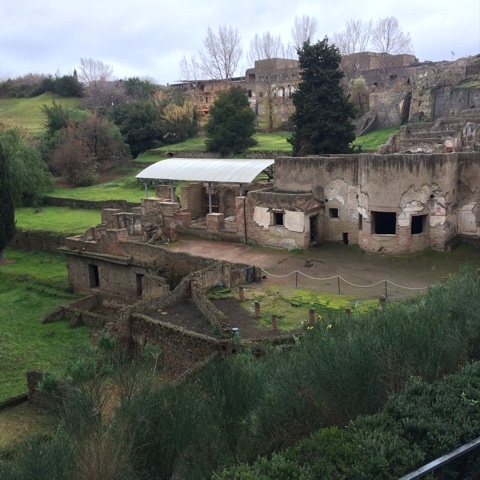 It's truly hard to imagine that this entire place was just buried in ash and mud until 1748 when excavations began. 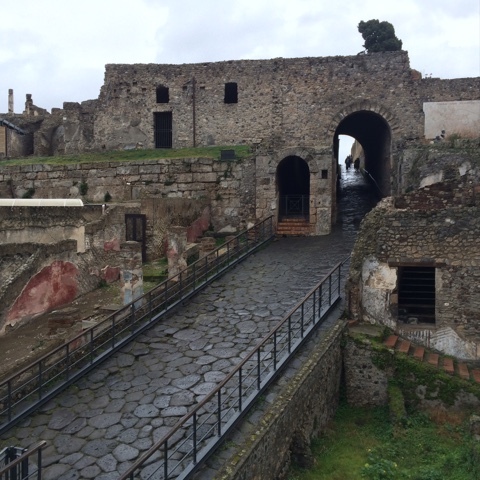 What is clear is that Pompeii was a bustling city, filled with rich and poor, marketplaces, and loads of commerce. 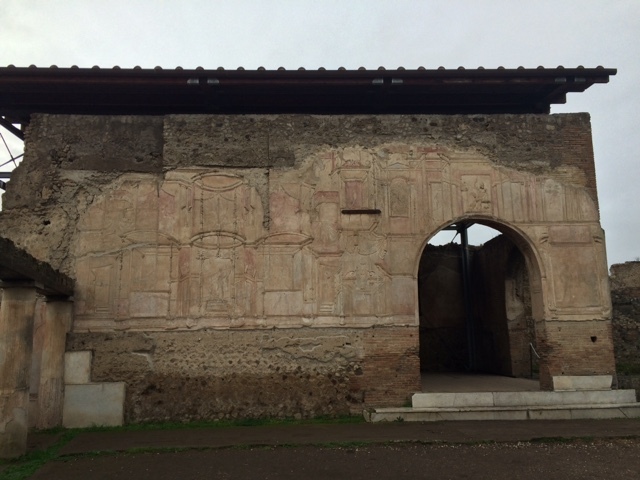 The most well-restored house, the house of Vetti, was closed and that was a pretty big disappointment. But there was still loads to look at. 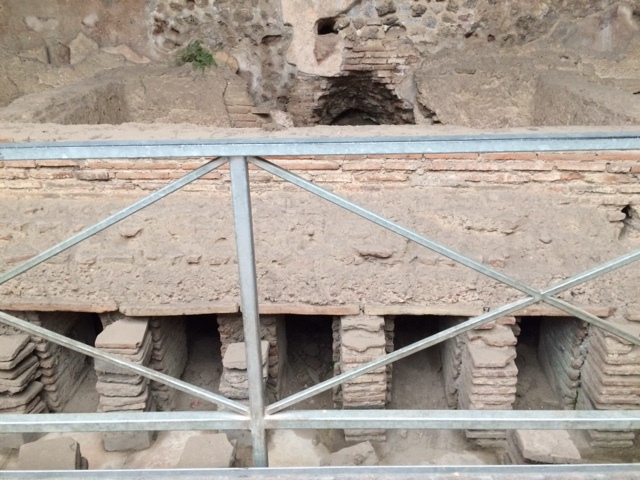 The baths were especially impressive and highlighted the genius behind the ways in which the Romans built intensive systems to heat floors and water. The same priniciples of a place to work out, a pool to heat up in and a pool to cool off in are still applied to high end spas worldwide! The houses were quite impressive as well and the age old warning of beware of the dog was in use even way back when. 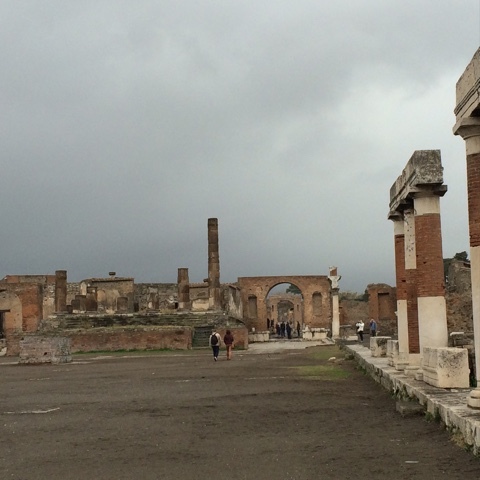 The forum was impressive in size and one could easily imagine the bustle of people and chariots buzzing around this area. 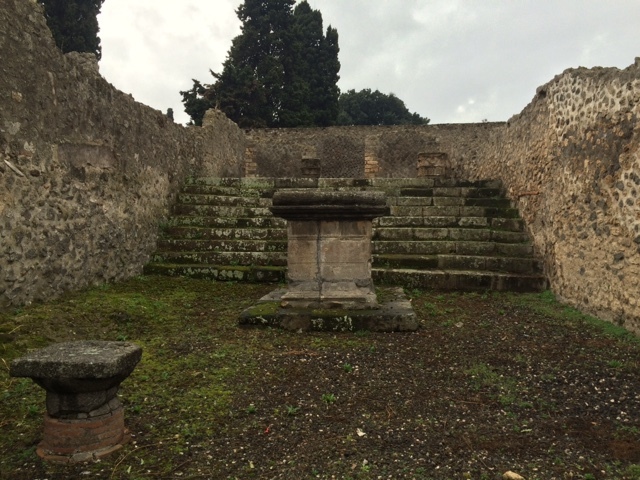 There are several temples to various deities scattered throughout the city. 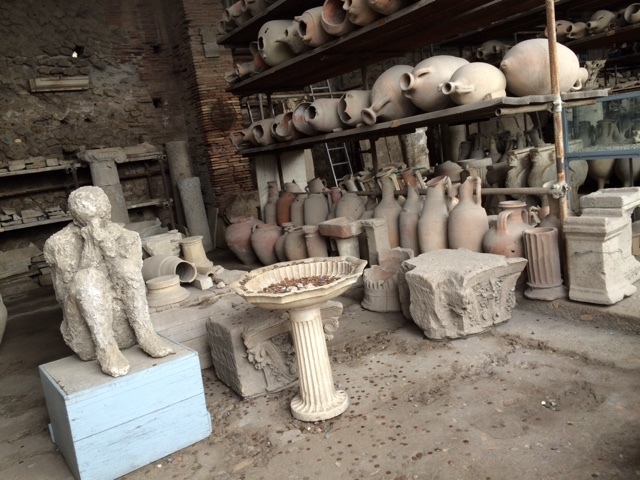 One section of the marketplace is now used to store artifacts that have been found on the site. 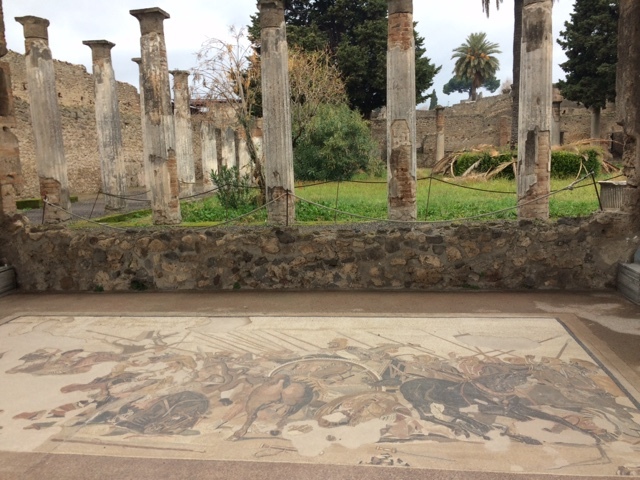 (Most are preserved in the archeological museum in Naples). 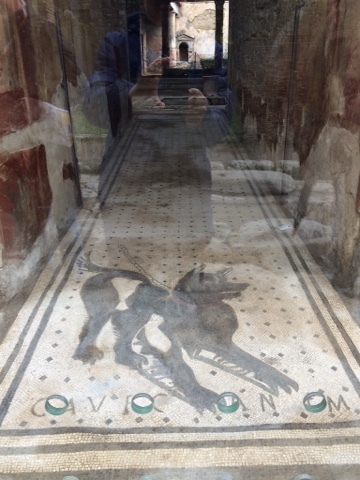 One mosaic floor has been replaced with a replica. 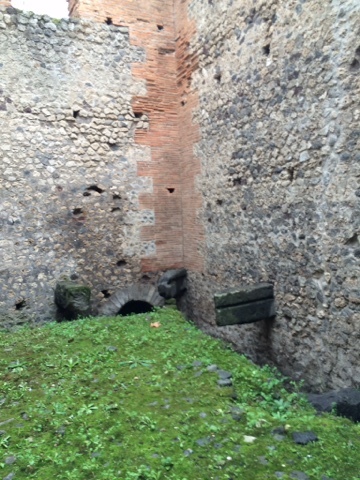 The public toilets (imagine, planks with holes set over the stones protruding from the wall) made me happy for my modern plumbing but to be fair, Italy could invest in some toilet seats for the public bathrooms. 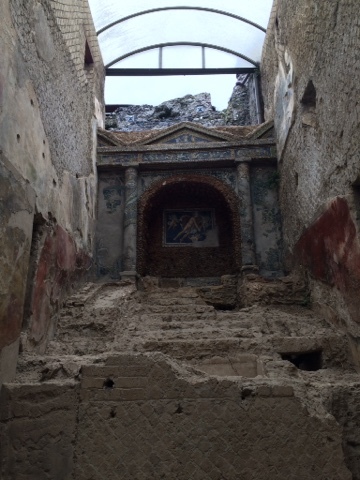 And some of the paint from the frescoes was still vaguely visible. Some of opulence that dotted this town must've been as impressive as the hotel we viewed last night! 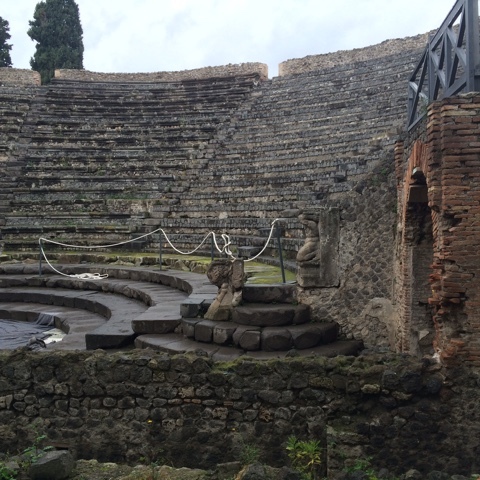 Both the small theater and the large amphitheater were impressive. 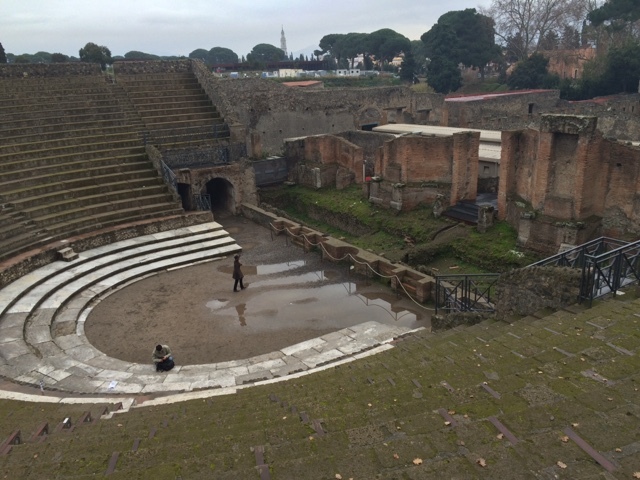 The Romans liked their entertainment! Even in ancient times, there were box seats (the platform above the arches) and the close, good seats were reserved for the upper crust. 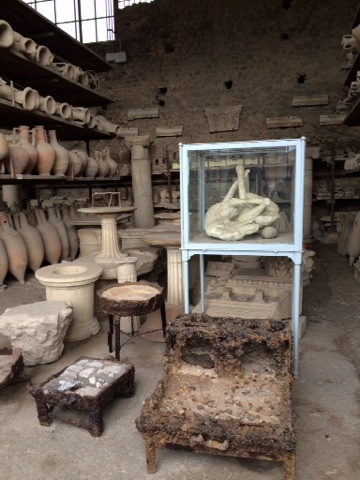 An interesting casting process was employed to create casts of people who were lost in the eruption. Fascinating but wow, also incredibly sad. 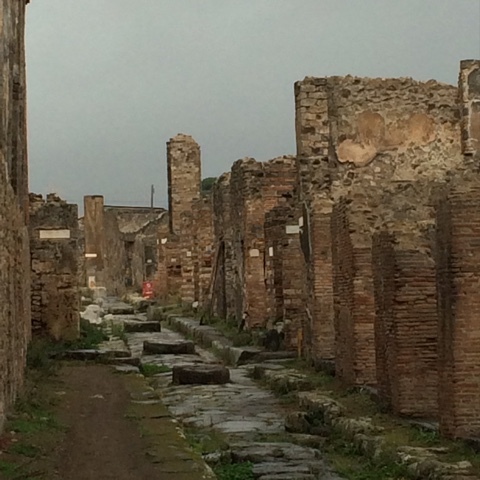 It is truly hard to imagine what it must've been like to be going out about your business and suddenly be hit with a rush of hot mud and volcanic ash. One can only hope that death came quickly. 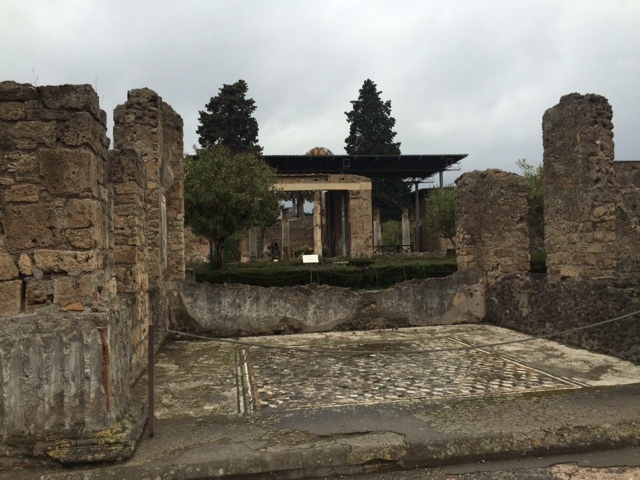 As mentioned, there is no way to capture the experience of visiting Pompeii. 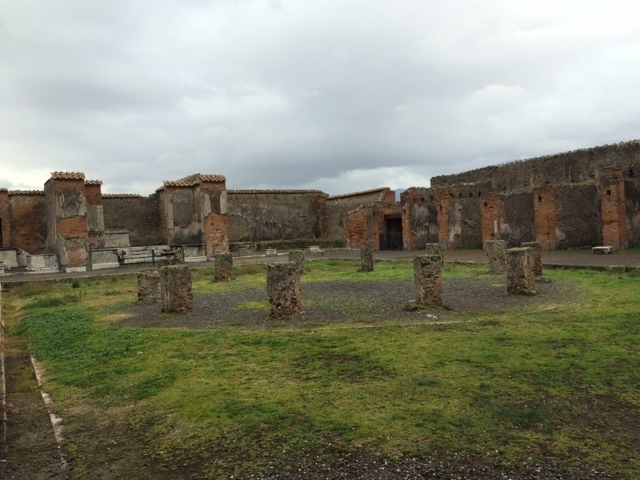 You have to go there and then take a class on Roman history and Pompeii!